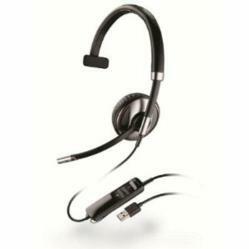 The Plantronics Blacktop 500 telephone headset is a lightweight and flexible Bluetooth headset designed for commercial and professional drivers including delivery personnel, cab drivers and truckers. The Blacktop 500 pulls out all the stops when it comes to comfort, sound quality, noise cancellation and hands-free convenience, so that these driving pros can get the job done without missing a step. Out of all the concerns professional drivers face, safety is first. Telcom & Data, a leader in business phone systems, is pleased to introduce the Plantronics Blacktop 500 Bluetooth headset to enhance driver safety. The headset has been designed specifically to keep commercial drivers’ eyes on the road and hands on the wheel. The unit cancels road noise, stays comfortable all day, and lets drivers easily manage calls while complying with the federal law that bans handheld cell phone use. The Plantronics Blacktop 500 headset delivers great features for in-vehicle use. To ensure the highest level of performance and sound quality, the unit is designed to cancel out road and engine noises. The Blacktop 500 features Plantronics’ Smart Sensor™ technology which detects when the headset is being worn and automatically routes the audio – both calls and media like iTunes and Pandora – from the mobile phone to the headset whenever it’s put on. An in-vehicle charging system delivers unlimited talk time while driving and the USB connection can also be used for Internet chat or movies while taking a driving break. For more information about the Plantronics Blacktop 500 phone headset, visit Telcom & Data’s website or call 1-800-335-0229. About Telcom & Data: Since 1996 Telcom & Data has been providing thousands of telecommunications solutions to organizations around the world to measurably improve communications. The company is a leader in business phone systems including VoIP phones, conference phones, and headsets. Telcom & Data maintains a network of over 1500 technicians with locations in Chicago, Milwaukee, and Miami. About Plantronics: Plantronics offers one of the industry's most complete families of corded and wireless products for unified communications. Widely recognized for their sound quality, reliability, and comfort, Plantronics' audio solutions help companies extend the benefits of IP communications.